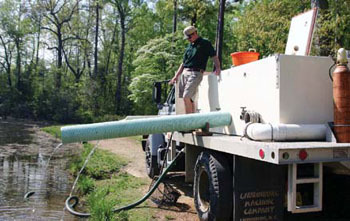 North Carolina Wildlife Resources Commission, 2007. Length: 14 to 16 in. Weight: 2.2 to 6.6 lbs. zooplankton, fish eggs and small fish. Spawning occurs in mid-river at night and can occur as early as November or as late as July. Juvenile shad remain in the river during summer and return downriver in the fall. Hatch in about 8 to 12 days at water temperature of 11 degrees to 15 degrees. No parental care given to young. Young reach sexual maturity within 5 to 7 years. The range of American shad extends along the east coast of North America from Newfoundland southward to Florida, but they are most abundant from Connecticut to North Carolina. Shad spawning migrations can extend up to 500 miles inland in some of the larger coastal rivers. Every year, in an event that heralds the coming of spring, large numbers of American shad make their way up several of North Carolina’s coastal rivers to their historic spawning grounds, where shad fishermen eagerly await their arrival. The American shad, commonly known as white shad in North Carolina, is a member of the Clupeidae, or herring family. The herring family is composed primarily of marine species and includes some of the most valuable food fish in the ocean. 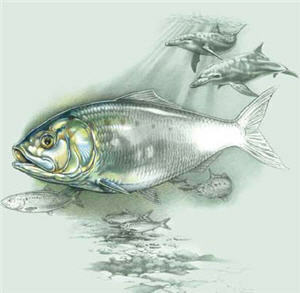 Hickory shad and river herring, as well as the American shad, are highly prized for their firm flesh and roe (fish eggs). 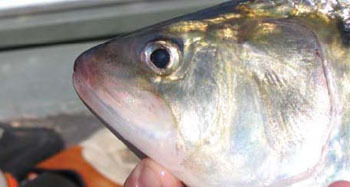 In addition to being prized food fish, some, such as the river herring, thread-fin and gizzard shad, are also commercially important baitfishes. Members of the herring family are thin fishes with silvery scales and bluish backs. They have a saw-toothed ridge along the belly and a row of one or more spots along both sides immediately behind the operculum. The American shad is often confused with the hickory shad as they are relatively similar in size and both have a row of 4 to 6 dark spots along both sides. However, the lower jaw of the hickory shad protrudes beyond the upper jaw, whereas the upper and lower jaw of the American shad, are relatively equal and meet terminally. The American shad also has a silvery patch on its cheek that is deeper than it is long, just the opposite of the hickory shad. 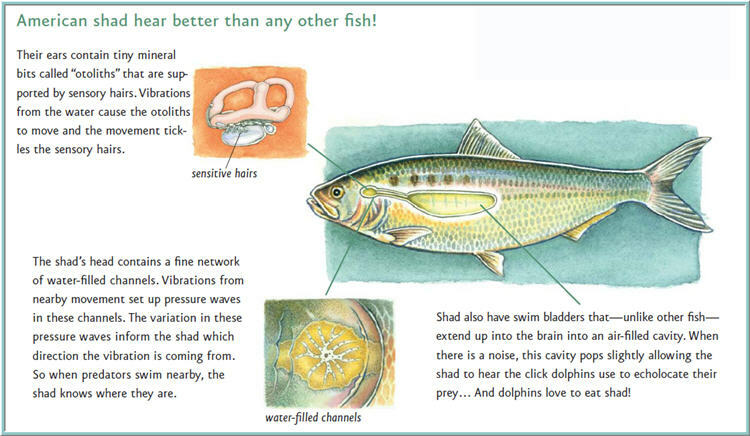 When juvenile American shad live in fresh water, their diet consists primarily of small aquatic insects and crustaceans such as copepods and dipterans (flies, midges and mosquitoes). Adult shad feed primarily on the larger zooplankton (copepods) but also consume fish eggs and small fish. During the spawning run, adult American shad typically do not feed yet they do strike at artificial lures (darts and small shiny spoons). Historically, American shad have supported important sport and commercial fisheries along the Atlantic coast. However, over-fishing and the construction of dams, which block spawning migrations, have depleted many shad populations. The recreational sport fishery is more important to residents than the commercial fishery in rivers still supporting spawning runs, such as the Cape Fear, Neuse and Tar/Pamlico rivers in North Carolina. Currently, federal and state resource agencies are implementing management programs aimed at restoring American shad to their former range and abundance. For example, a shad restoration project underway on the Roanoke River includes moving spawning adult shad upstream of major dams and stocking of hatchery-reared fry. was 11 years old and 23 in. long. Human activities—dam construction and commercial fishing in particular — have led directly to a decline in American shad populations throughout their range. Prized for their firm flesh and eggs, shad were commercially over-harvested between 1930 and 1960. 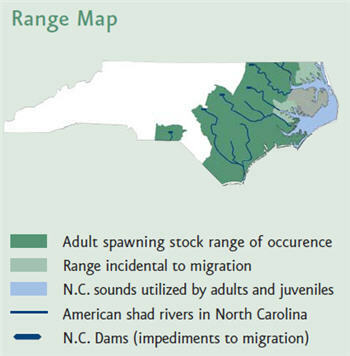 Increasing levels of water pollution from increased development across North Carolina have resulted in degraded spawning sites and decreased reproduction by the species. It’s an encouraging chapter in what has become an all-too-familiar bleak story of a natural resource lost because of habitat degradation and over-harvesting. American shad, once an important commercial and recreational fishery, declined sharply in the late 20th century; however, this trend may be reversing, thanks to the cooperative efforts of the N.C. Wildlife Resources Commission and the U.S. Fish and Wildlife Service. Since 1998, the two agencies have worked together to restore depleted populations of American shad along the Atlantic coast by stocking more than 8 million “marked” shad fry in the Roanoke River as part of the Roanoke River American Shad Restoration Program. So far, Commission biologists have captured more than 50 3- to 4-inch, hatchery-origin juveniles in the lower Roanoke River, as well as 3 adult fish with hatchery marks upstream on the spawning grounds. The appearance of these adult fish indicate that the propagation program is working and that some of the fish surviving are 4 to 5 years in the ocean and return to where they were stocked. Menhinick, E. F. The Freshwater Fishes of North Carolina. Raleigh, N.C.: N.C. Wildlife Resources Commission, 1991. Ross, S. W., F. C. Rohde and D. G. Lindquist. Endangered, Threatened, and Rare Fauna of North Carolina. Part 2: A Re-evaluation of the Marine and Estuarine Fishes (Occasional Papers of the North Carolina Biological Survey, 1988). Weiss-Glanz, L. S., J. G. Stanley, and J. R. Moring. “Species Profiles: Life Histories and Environmental Requirements of Coastal Fishes and Invertebrates (North Atlantic)— American Shad” (U.S. Fish and Wildlife Service Biological Report 82 (11.59). U.S. Army Corps of Engineers, TR EL-82-4, 1986). Illustrated by Jim Brown. Photos by James Cameron and National Geographic and N.C. Wildlife Resources Commission.